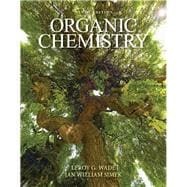 by Wade, Leroy G.; Simek, Jan W.
Wade & Simek’s Ninth edition of Organic Chemistry presents key principles of organic chemistry in the context of fundamental reasoning and problem solving. Authored to complement how students use a textbook today, new Problem Solving Strategies, Partially Solved Problems, Visual Reaction Guides and Reaction Starbursts encourage students to use the text before class as a primary introduction to organic chemistry as well as a comprehensive study tool for working problems and/or preparing for exams. With unparalleled and highly refined pedagogy, this Ninth edition gives students a contemporary overview of organic principles and the tools for organizing and understanding reaction mechanisms and synthetic organic chemistry. Pearson eText is a simple-to-use, mobile-optimized, personalized reading experience that can be adopted on its own as the main course material. It lets students highlight, take notes, and review key vocabulary all in one place, even when offline. Seamlessly integrated videos and other rich media engage students and give them access to the help they need, when they need it. Educators can easily share their own notes with students so they see the connection between their eText and what they learn in class – motivating them to keep reading, and keep learning. Mastering combines trusted author content with digital tools and a flexible platform to personalize the learning experience and improve results for each student.Built for, and directly tied to the text, Mastering Chemistry enables an extension of learning, allowing students a platform to practice, learn, and apply outside of the classroom. Note: You are purchasing a standalone book; Pearson eText and Mastering Chemistry do not come packaged with this content. Students, ask your instructor for the correct package ISBN and Course ID. Instructors, contact your Pearson representative for more information. L.G. “Skip” Wade—After receiving his B.A. from Rice in 1969, Wade went on to Harvard University, where he did research with Professor James D. White. While at Harvard, he served as the Head Teaching Fellow for the organic laboratories and was strongly influenced by the teaching methods of two master educators, Professors Leonard K. Nash and Frank H. Westheimer. After completing his Ph.D. at Harvard in 1974, Dr. Wade joined the chemistry faculty at Colorado State University. Over the course of fifteen years at Colorado State, Dr. Wade taught organic chemistry to thousands of students working toward careers in all areas of biology, chemistry, human medicine, veterinary medicine, and environmental studies. He also authored research papers in organic synthesis and in chemical education, as well as eleven books reviewing current research in organic synthesis. Since 1989, Dr. Wade has been a chemistry professor at Whitman College, where he teaches organic chemistry and pursues interests in organic synthesis and forensic chemistry. Dr. Wade received the A.E. Lange Award for Distinguished Science Teaching at Whitman in 1993.